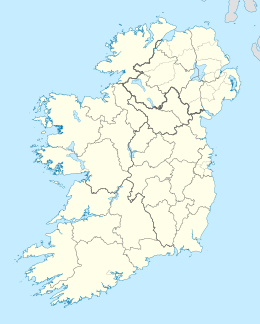 Great Blasket (An Blascaod Mór in Irish) is the principal island of the Blaskets, County Kerry, Ireland. The island lies approximately 2 km from the mainland at Dunmore Head, and extends 6 km to the southwest, rising to 292 metres at its highest point (An Cró Mór). The nearest mainland town is Dunquin; a ferry to the island operates from a nearby pier during summer months. Despite its close proximity to the mainland, visitors to the Dingle coast can often not see the island through the notorious sea mist. The most easterly extremity of the island, Garraun Point at 52°06′16″N 10°30′27″W﻿ / ﻿52.1045°N 10.5074°W﻿ / 52.1045; -10.5074 has been incorrectly cited as being the most westerly point of the Irish mainland. A Ferriter castle once stood at Rinn an Chaisleáin. The island was inhabited until 1953, when the Irish government decided that it could no longer guarantee the safety of the remaining population; however, the islanders had been requesting that they be relocated since 1947. It was the death of Seánín Ó Cearnaigh that acted as a catalyst in the island's evacuation. Sean had become ill and as a result of poor weather, no doctor or priest could reach the island. Inclement weather prevented his body being taken to the consecrated graveyard across the Blasket Sound in Dunquin for a number of days. It was this tragic event that led the islanders to contact the Irish government and request that they be evacuated. It was the home of three noted Irish writers: Tomás Ó Criomhthain, Peig Sayers and Muiris Ó Súilleabháin. Their works were all written in Irish, and have all been translated into English, as well as other languages. The homes of Tomás Ó Criomhthain and Muiris Ó Súilleabháin are now in ruins but the house in which Sayers once lived has been restored, and used to form part of the hostel which previously functioned on the island. Until 1953, the inhabitants of Great Blasket Island formed the most westerly settlement in Ireland. The small fishing community (even at its peak the population was hardly more than 160) mostly lived in primitive cottages perched on the relatively sheltered north-east shore. In April 1947, having been cut off from the mainland for weeks due to bad weather, the islanders sent a telegram to the Taoiseach, Éamon de Valera, urgently requesting supplies which duly arrived two days later by boat. The table below reports data on Great Blasket's population taken from Discover the Islands of Ireland (Alex Ritsema, Collins Press, 1999) and the Census of Ireland. Considering the tiny population, the island has produced a remarkable number of gifted writers who brought vividly to life their harsh existence and who kept alive old Irish folk tales of the land. Best known are Machnamh Seanamhná (An Old Woman's Reflections, Peig Sayers, 1939), Fiche Bliain Ag Fás (Twenty Years A-Growing, Muiris Ó Súilleabháin, 1933), and An tOileánach (The Islandman, Tomás Ó Criomhthain, 1929). There is self-catering accommodation available in five restored houses at the top of the village on the Great Blasket Island. Accommodation consists of simple self-catering facilities including basic amenities with dorms to suit individuals/ groups and private double rooms also available for couples sharing. The hostel and cafe that once operated on the island have been closed as a result of a dispute between the Irish State which wishes to make the island a national park and an individual who claims to own the greater part of the island. The differences between the State and Blascaoid Mor Teoranta (BMT) were settled by an agreement made in August 2007; subject to the granting of planning permission, the deal meant that more than 95% of the island land, including the old village, would be sold to the State and become a de facto national park. In 2009 the Office of Public Works bought most of the property on the island, including the deserted village, and the state is now the majority landowner. Guided tours of the island were launched in 2010 and plans are underway for the preservation and conservation of the old village. ^ "Ireland - Geographical facts and figures". Travel through the Ireland story... Retrieved 2014-07-14. ^ "About the Great Blasket Island - Great Blasket Island". Great Blasket Island. Retrieved 2016-05-23. ^ "Great Blasket Island hostel - Blasket Island". Great Blasket Island. Retrieved 2016-05-23. This page was last edited on 19 November 2018, at 19:20 (UTC).